When you disable the autofill controller you expose yourself to a number of risks, depending on machine. 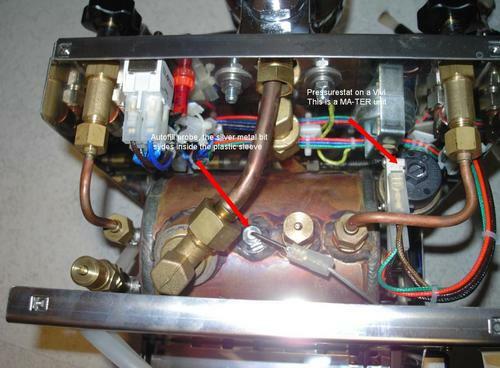 If the safety valve, over pressure valve in the boiler is faulty and you keep the pump on, you could potentially pressurise the boiler to 15 bar! risking of damage to seals etc.. again these should stand the pressure, but things do age and become weaker. You forget to refit the autofill, upon assembling the machine, you put it on the timer as usual and wake up to…………!! Your machine is second hand and has been tinkered with without your knowledge. The safety valve was leaking so the previous owner blanked it off, thinking the vacuum breaker would do the same job.! This could apply to any safety feature that was causing them a problem. Your Gicar box is faulty and the normal protection fail-safes are not working properly. Accidents are usually a combination of more than one failure in a system. This holds true for most accident investigations "had only x failed then it would have been OK, but with x and Y failing and causing Z to fail…then catastrophe). It's just a very quick off the top of my head list…..but for the benefits, which are minimal, I don't think it's worth doing on a regular basis. In a home machine, the scale above the waterline is going to be minimal, the scale on the waterline won't matter that much and normal descaling will shift plenty of it. The scale that's really important is that around the element. Now I'm not saying that periodically possibly every year or two, the boiler won't benefit from a more thorough descale (as you do), but this should be done with absolute knowledge of your machine.